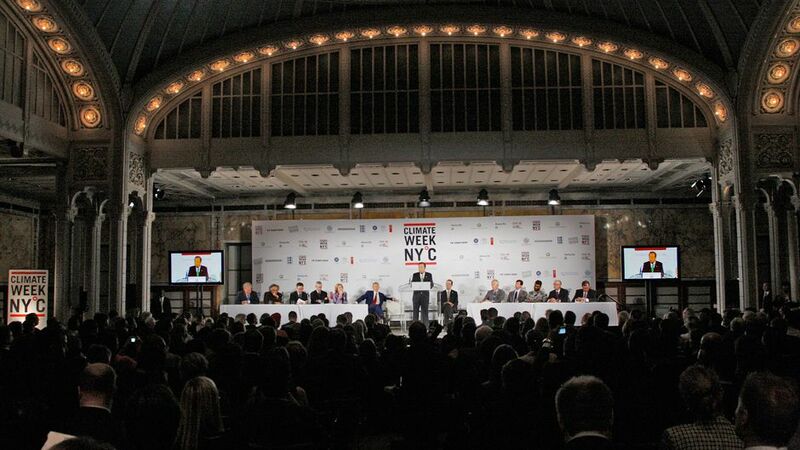 Yesterday’s declarations by global leaders at a climate summit in New York are hot news world-wide. The sincere-sounding vows of the planet’s top greenhouse gas emitters, the United States and China, are making headlines. Japan’s call for an international financing mechanism to aid developing countries, and the standing ovation received by France’s Nicolas Sarkozy as he championed Africa, are set out in black and white for eager readers to absorb. “The climate negotiations are proceeding at glacial speed. The world’s glaciers are now melting faster than human progress to protect them — and us,” quipped UN Secretary-General Ban Ki-Moon. Nonetheless, at the end of the summit, Ban Ki-Moon and Danish Prime Minister Lars Loekke Rasmussen, who will host December’s climate treaty talks, said they were encouraged at the prospects. “This feeling of political momentum — that was very strong,” said Loekke Rasmussen. But what was really achieved is hard to unravel. Despite the summit theme of “Power Green Growth, Protect the Planet”, it is quite clear that the gathering did not achieve one critical goal: to help leaders “decide how to start an energy revolution“. It seems that only the same old too-low (below “what science demands”) targets were on offer. What are average citizens to take away? No real sense of urgency, just the need to continue standing by, finding ways to lower personal carbon footprints, waiting to see what happens in Copenhagen in December, hoping that the petitions they signed will miraculously influence politicians? Perhaps if there were more concrete outcomes, or something that could be implemented that didn’t allow room for government waffling, we could feel hopeful. Briefly explained in the recently-premiered film Age of Stupid — with the aid of a simple but compelling animation (see video) that represents countries’ per capita emissions by the size of blue cartoon people — is the most equitable and, what could be, the most efficient solution: a global emissions cap. The cap scheme is based on the idea that each person on the planet has the right to the same carbon footprint. Therefore, a “global budget” of CO2 emissions should be distributed among states according to population size. A report released earlier this month by the German Advisory Council on Global Change proposes this as the world’s best bet for limiting the average global temperature rise to 2°C, widely regarded as necessary to avoid tipping the climate system into havoc. Of course, under such a plan the scale and speed of emission cuts required of developed nations is far greater than the commitments governments are currently willing to make. The New Scientist video below illustrates the scheme as a “thought experiment”, simply to make a point. Graphing out what the “budget” would look like without a trading aspect (rich countries’ ability to buy “carbon credits” from low-emitting countries), the narrator shows that a per capita cap would mean that most industrialized countries are already “carbon bankrupt” and would not be permitted any more emissions. (Of course the plan does include trading so, though dramatic cuts would be in order, rich countries would not be shut down). The Council maintains that effective climate policy demands “restructuring to form a low-carbon world economy”, including establishment of a world climate bank that would monitor the scheme and the decarbonisation roadmaps of all countries. Their “budget approach”, the Council says, can lead to success at the climate negotiations in Copenhagen. Meanwhile, there could be some inspiration to be gleaned from the summit. Six days into office, Japan’s Prime Minister Yukio Hatoyama impressed many with his “politically bold and crucially timed pledge” to not only cut emissions by 25% by 2020, but to introduce a domestic emission trading system and a tariff for renewable energy, as well as considering a global warming tax. While it is the first time that Japan has shown such strong international leadership in the climate political arena, it is also a cause of concern for many, including the Japanese business sector, and skeptics like one blogger who says that although the goal is fine, the new administration has no clue how to achieve it. Cynicism aside, this kind of ambitious target is the type that focuses attention, mobilizes people and promotes innovation. Japanese scientists have been doing a lot of work already and they are pretty confident that the target can be reached. Summit All Up by Carol Smith is licensed under a Creative Commons Attribution-NonCommercial-ShareAlike 3.0 Unported License.